Puffing on a cigarette and knocking back beers, the man leading the world's biggest missing child inquiry enjoys yet another long, boozy lunch. Portuguese police chief Goncalo Amaral worked as little as four-and-a--half hours a day this week - despite a mountain of uninvestigated sightings of Madeleine McCann on his desk. The Sunday Mirror has discovered that 252 possible tip-offs about the four-year-old have been reported to Amaral, any one of which might just lead to her being traced. But the vast majority have not even been checked. Amaral, in charge of a squad of 30 detectives, has convinced himself she is dead, despite having no evidence for it. And since the return from Portugal of Kate and Gerry McCann and most of the media covering the case, many in his squad have had their feet up, their main role seemingly to provide drinking companions for their boss. The McCanns, who cling to the hope of getting Madeleine back, will be appalled that the inquiry - supposedly still running at full-steam - has effectively stopped amid a welter of boozy lunch breaks. A source close to the family said: "It is devastating for them to know leads are not being chased up. They always feared that once they left Portugal, the inquiry would peter out." On Wednesday, when the world was praying that a little girl seen in Morocco may be Madeleine, Amaral and his team seemed utterly uninterested and left it to the British media to establish it was a false alarm. He instead enjoyed a twohour 10 minute lunch washed down with wine. The next day was a similar tale - lunch lasted two-and-a-half hours. And on Friday he was gone for more than three. Even more appallingly, while Kate and Gerry have been warned they face a year in jail for discussing the case, Amaral was overheard in a cafe brazenly accusing them of killing Madeleine. In a conversation with a Portuguese racing driver, he was heard saying he was sure the little girl was dead even though there's no final proof that she is. 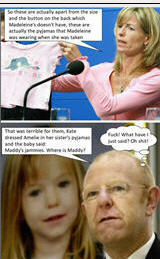 He told ex-F1 star Pedro Lamy he believed the McCanns drugged Madeleine to keep her quiet and accidentally killed her. Amaral said: "The police case is we are sure the parents kiled Madeleine. They are both doctors and know about drugs. We are confident in our case." One of the group outrageously chipped in how he believed the couple could have taken cocaine on the night Madeleine disappeared. 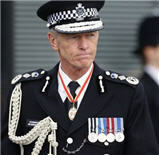 The conversation was a flagrant breach of the judicial secrecy rules which prevent Kate and Gerry from defending themselves against police leaks. Amaral, his beer belly spilling over his baggy jeans and a creased shirt unbuttoned to reveal a gold medallion, looked more like a holidaymaker than a detective in charge of a case which today enters its 150th day. Only last week Antonio Cluny, president of Portugal's public prosecutors service, said the search for Madeleine's body was a huge priority for the police. 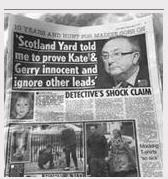 Until it is found, he said, prosecutors had to consider the possibility that almost anything could have happened to the girl and they could not rely on the police theory that Kate and Gerry were responsible for her death. He said: "Without the little girl's body, everything is extremely complicated." Amaral, who is himself under investigation for allegedly helping to cover up a police beating carried out to extract a confession from the mother of another missing girl, is the regional head of the Policia Judiciaria, or PJ for short. The Carvi fish restaurant where he spends hundreds of pounds a week is a few minutes' walk from PJ headquarters in the seaside town of Portimao. The Sunday Mirror watched as Amaral and colleagues tucked into a series of fish dishes, washed down with lager and white wine. His longest session, which lasted three hours and 10 minutes, was on Friday afternoon. It meant he could not have carried out more than four-and-a-half hours of work all day. Amaral, 47, who has a young daughter, is No3 in the Madeleine inquiry, in charge of its day-to-day running. After one drinking spree this week, the moustachioed police chief got in his car and drove home. The McCanns were questioned separately at the grim PJ building for up to 10 hours earlier this month when they became suspects in Madeleine's disappearance. Kate was also told if she agreed to admit she had accidentally killed Madeleine she would receive a lighter sentence. The couple, now at home in Rothley, Leics, vehemently deny having anything to do with their daughter's disappearance. The McCanns' official spokesman Clarence Mitchell said last night: "Kate and Gerry want to cooperate with the Portuguese police and would hope that they and their resources are being deployed as effectively as possible at all times." And writing in his regular internet blog this week Gerry McCann told of the rollercoaster ride they experienced this week after the false alarm in Morocco. He added: "Despite the disappointment, it is encouraging that people are still being vigilant and have not stopped looking for Madeleine. This is so incredibly important to us both." Although not, it seems, to Chief Inspector Goncalo Amaral. WEDNESDAY: While the world hopes a young blonde girl seen in Morocco might be Madeleine, Amaral and his team have other priorities. 9.30am: Amaral arrives for work in his car wearing a beige jacket, jeans and a white shirt. 1.17pm: He casually strolls out of the police building and takes a leisurely stroll to the Carvi restaurant with his boss Guilhermino Encarnacao - dubbed Inspector Clueless - who is making a rare visit to the investigation. Lunch: They share a bottle of wine white and two fish platters before heading back to the office at 3.27pm. THURSDAY: Amaral's boss has left town, meaning he can focus properly his lunch. 1.07pm: It's down tools time as he heads for lunch with a younger colleague. 1.15pm: They are joined by a Nancy Dell'Olio lookalike, who wears a figure-hugging black dress. The woman greets Amaral by patting him on the backside and ruffling his thinning hair. 1.20pm: The group move to Amaral's preferred secluded table. His first drink is a pinkcoloured fruit cordial but he's soon switching to a glass of Portuguese Sagres lager. 2.19pm: Amaral has a coughing fit which lasts more than three minutes. He splutters at the table, sipping water before picking up the bill for the £84 meal. 6.13pm: Amaral emerges from the building with the colleague he went to lunch with. They return to the Carvi and sit watching the evening news on the TV. 6.48pm: The young man leaves after another beer. Amaral stays on, eating a couple of fish dishes. 9.55pm: After a few more beers, he heads back to his car and drives home. FRIDAY: 9.54am: Amaral pitches up for work even later than normal. 1.08pm: After fewer than three hours at his desk, he's off to pick up his daughter from school and brings her back to the Carvi with him. 1.15pm: He orders the first of at least four beers. He and his colleague also order a bottle of white wine while the little girl has a soft drink. 2.14pm: He takes his daughter back to the car. She is driven off and he is joined by two more friends and his racing driver friend. Amaral then has at least three more beers and a glass of wine. 4.23pm: It's nearly time to go home and, after splitting the bill and saying goodbye to his friend, Amaral and two of his colleagues slowly walk back to their office. 5.55pm: After just an hour and 32 minutes back at his desk, Amaral emerges into the bright afternoon sunlight carrying a white plastic bag and blue folder. He walks the short distance from his office to the underground car park. 6.10pm: After getting into his navy blue Volvo he heads for home, and the 148th day of the Madeleine hunt ends as it began - in a hive of inactivity. 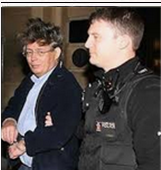 Hi Verdi, Mr Goncalo Amaral must have raised a few "Heckles" with the McCann Family on all of this " Under Cover Reporting" of his Three Hr lunches, could this have been MI5/6 Officers or Clarence Mitchell doing his PR for the family? 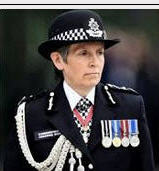 At a time when the Crime Dogs, Eddie, Keela from Martin Grimes Team uncovered certain pieces of DNA/LCI, that Birmingham FSS, ruled they had contaminated the Trace Evidence,15;19 Markers,80% belonging to Madeleine McCann? Seems as though certain elements wanted to have a certain Portugal PJ detective removed from the case, was this for Not undertaking his" Duties Properly" or Mr Amaral was on the Ball, so to say! then you have the Libel claim by the McCann Family against Mr Amaral, that his legal Team overturned in His favour from 2008, which brings Operation Grange, Crime Watch October 14, 2013 to Netflix 2019, raising doubts about Portugal PJ incompetence in Madeleine McCann's disappearance, 3 May 2007, which is where you are today, still None the wiser!